For other uses, see Last Kiss (disambiguation). The narrator borrows his father's car to take his beloved sweetheart out on a romantic date (on a rainy night). Coming upon a stalled car in the road, the narrator swerves to the right to avoid it, losing control and crashing violently in the process. The crash renders both the narrator and his girlfriend unconscious. The narrator later regains consciousness and finds several people at the scene of the accident, but was still able to find his girlfriend, still lying unconscious. When the narrator cradles his girlfriend lovingly in his arms, she regains partial consciousness, smiling and asking the narrator to "hold me, darling, for a little while." The narrator then gives his sweetheart what would be their "last romantic kiss" as she fades into death and enters the afterlife. In the song's chorus, the narrator vows to be a good boy so that he may reunite with his dear sweetheart when his time comes, believing she has made it into Heaven. The song was supposedly based on the true story of Jeanette Clark and J.L. Hancock, who were both 16 years old when their car hit a tractor-trailer on a road in rural Barnesville, Georgia. The problem is that the song was recorded more than a year before the accident supposedly happened. Clark and Hancock were on a date a few days before Christmas in 1962. A local gas station attendant helping with the recovery of the bodies did not recognize his own daughter. Hancock and Clark's friend Wayne Cooper, who was riding with them, was killed instantly. Their two other friends, Jewel Emerson and Ed Shockley, survived with serious injuries. Wayne Cochran's drummer had been dating Jeannette Clark's sister at the time of the wreck. The song was written by Wayne Cochran, who lived on Route 1941 in Georgia, about 15 miles from the crash site. It was a busy road, and Cochran witnessed lots of accidents on it. He was working on a song based on all the crashes he saw, and was about halfway done with "Last Kiss" when he heard about the wreck in Barnesville. There was an intense emotional response from the community after the tragedy, and Cochran used those feelings to finish the song, which he dedicated to Jeanette Clark. In the summer of 1961, four friends traveled to the University of Georgia in Athens, Georgia, to record a song Wayne Cochran had written, with Joe Carpenter, Randall Hoyal and Bobby McGlon, called "Last Kiss". Wayne Cochran (vocals), Joe Carpenter (guitar), Bobby Rakestraw (bass), and Jerry Reppert (drums) recorded the song for the Gala label, a small label based in Vidalia. When the labels for the 45s, Gala #117, were printed, the names of co-writers Joe Carpenter, Randall Hoyal and Bobby McGlon were left off. Cochran evidently never asked Gala to change the label, to include the other names; to this day Cochran is the only one credited with writing "Last Kiss". Cochran would go on to re-record the song for release on Aire Records (1962), in a slightly different tempo, with some changes to the lyrics and for re-release on King Records in 1963. In all, Cochran recorded four versions of the song, the original, Gala #117, Boblo Records #101, King Records #5856, and Aire Records #150, released as "Last Kiss" b/w "Edge of the Sea", with Cochran sharing vocals with an unnamed male vocalist. The Aire disc was easily the most different version of all, with heavy reverb and a staccato drumbeat. Aire Records, located in Dublin, Georgia, credited the song to Perry Music, as did the Gala recording. The Boblo disc credited "Last Kiss" to Macon Music, while the King record cited Boblo-BMI. The Boblo record featured "Last Kiss II" b/w "Hey! Baby" (Boblo 101-A), produced by Bobby Smith, offering another take on the song, with different lyrics, a faster tempo, and different instrumentation. A fifth version of the song was cobbled from the Boblo recording, rechanneled for stereo, on Radical Musik Records, probably around 1973. The original opens with the sound of a screeching crash, then the drums start, and the bass picks up the beat; in contrast, the final version sounds like a cross between a pop arrangement and a reggae recording. Cochran loaded 45s in the trunk of his car, taking them along to gigs, to sell to fans, although it didn't help much. Over the course of the four versions, Cochran expanded his (and his co-writers') concept of the song, seeking a wider audience. Cochran would later go on to Miami, where he found moderate success playing nightclubs, with his band, CC Ryders. Jackie Gleason had Cochran on his television show several times. Cochran went into the ministry, in later years; he doesn't talk about his rock and roll years anymore. A long-running rumor held the song was based on an auto accident that killed 16-year-old Jeanette Clark, who was on a date with J.L. Hancock, also 16, in Barnesville, Georgia, on December 22, 1962. It was the Saturday before Christmas; the pair were with a group of friends, riding in a 1954 Chevrolet, driven by Hancock, in traffic. While traveling on U.S. Route 341, their car hit a tractor trailer carrying a load of logs in rural Barnesville, Georgia; Clark, Hancock and Wayne Cooper were killed. Two other teens in the car were seriously injured, but survived. However, this tragedy could not be the source of the song, as it had been recorded in the summer of 1961, more than a year earlier. Wayne Cochran lived on Georgia State Route 19/41, when he wrote "Last Kiss", only 15 miles away from the crash site, and was reportedly inspired to write the song after seeing many accidents on the highway. He re-recorded "Last Kiss", for release on King Records, in 1962, dedicating it to Clark, a fact which probably explains association of the song with the tragic crash. On September 18, 1961, Billboard Music Week printed a review of the song "Last Kiss" and gave it three stars but said nothing about the song itself in the review. None of the records charted, failing even to reach the "Bubbling Under" level, although the record was a local hit in Georgia, before it disappeared. Billboard had kind words for the B-Side, in its review of "Last Kiss" — giving four stars to the song called "Funny Feeling", on the flip side, written by Joe Carpenter and Milt "Pete" Skelton. The reviewer said, "Blues, chanted in relaxed style, with a funky guitar backing. Derivative but a good job." "Funny Feeling" didn't make an impression on disc jockeys, either. 1964 in San Angelo, Texas Accurate Sound Co.
"Last Kiss" came to the attention of record promoter Sonley Roush, a Texas promoter eking out a living, looking for the next big thing. Roush brought the song to a group that he booked around West Texas, the Cavaliers of San Angelo, with the proviso that singer J. Frank Wilson was still with the band. Wilson joined the Cavaliers after his discharge from Goodfellow Air Force Base (San Angelo, Texas) in 1962, but had left for a while, unsure of the future. Credit should be given also to Sid Holmes of San Angelo for founding the original Cavaliers band in c.1956. He later discovered J. Frank Wilson in the early 1960s and invited him to join the band and did sign him. Holmes, a fine rockabilly guitarist, also taught future Cavalier Lewis Elliott to play bass guitar, and also brought Jim Wynne into the band to play piano. Sonley Roush would subsequently split the group to place lead singer Wilson with another musician or two. By this time Holmes had already left the group. Be that as it may, J. Frank Wilson (vocalist), Gene Croyle (guitar), Roland Atkinson (drums), Lewis Elliott (bass), and Jim Wynne (piano), along with Sonley Roush (manager/promoter) and Ron Newdoll (studio owner and engineer) were all present at Accurate Sound Recording studio in San Angelo around 1:00 pm in early August, 1964, when they made the record that would bring them lasting fame. The band worked all afternoon on the song, recording it over and over, with few pauses, for three straight hours, until Roush was satisfied with take number 64. The record was first released locally, on Le Cam Records (#722), then on Tamara Records (#761), becoming a local hit. Eventually released on Josie Records (#923), the record became a national hit in the fall of 1964. Released on September 5, 1964, Josie 923 spent 15 weeks on the charts, reaching number 2 on November 7, held out of the top spot by "Baby Love", the second number 1 hit for The Supremes, which spent four weeks in the top spot. "Last Kiss" would spend eight weeks in the top ten; the record selling over one million copies, and propelling the resulting album onto the album charts. The Le Cam #722-A disc running time is noted as 2m 14s, while both the Tamara Records #761 release and the Josie Records #923 platter have a time of 2m 25s, an 11-second difference. J. Frank Wilson and the Cavaliers had their first and only commercial success with "Last Kiss". Their cover version reached the top 10 in October, staying for eight weeks. It eventually reached number two on the Billboard Hot 100 charts, and also earned the band a gold record. Roush took a reconstituted version of the band, J. Frank Wilson, Gene Croyle, Bobby Wood, Jerome Graham, and Phil Trunzo, on a brutal promotional tour, in support of the record. On a concert trip to Ohio, the band had just left Parkersburg, West Virginia, heading to Lima, Ohio, for a performance at the Candy Cane Club. At about 5:15 a.m., Roush apparently fell asleep at the wheel. The car drifted across the centerline and rammed head-on into a trailer truck. Roush was killed instantly, but Wilson, sitting in the front seat, and Bobby Wood (vocalist / piano) from Memphis, sitting in the back, both suffered serious injuries, including broken ribs and a broken ankle. Wilson went on with the tour, though, taking only a week off. People still remember him coming out on the stage on crutches to sing "Last Kiss" and "Hey, Little One". The accident had a curious effect on record sales, nevertheless, pushing the song to number 2 (it had previously stalled at number 3) on the national charts. The Last Kiss album cover shows Wilson kneeling over the young woman portraying the dying girl. Supposedly, first printings of the cover showed blood trickling down the girl's face, but it was air-brushed out by the record company for fear that alienating parents would limit sales of the album. Wilson would continue to record, unsuccessfully, until 1978. He died on October 4, 1991, due to alcoholism caused by business stresses and pain caused from his injuries in the car wreck. When he died, he was being treated in a nursing home,, only 49 years old. Wilson had been cheated out of all of the money that the record had brought in by his label and manager. In 1973, "Last Kiss" was covered by the Canadian group Wednesday. Their version reached number two in Canada and number 34 in the United States. It is ranked as the 27th biggest Canadian hit of 1973. Their version climbed up the charts very slowly, and spent three weeks longer on the American charts than the Cavaliers' much bigger hit. As a result of the popularity of Wednesday's rendition, the Cavaliers' version was re-released (Virgo 506) at the end of 1973. It reached number 92 in January 1974, spending a total of five weeks on the Billboard Hot 100. The original hit version re-charted five weeks after the version by Wednesday entered the charts. September 19, 1998 at Constitution Hall, Washington, D.C.
(1999) "Nothing as It Seems"
"Last Kiss" was also covered by the American rock band Pearl Jam for the 1999 charity album No Boundaries: A Benefit for the Kosovar Refugees. It would also appear on the group's 2003 rarities album Lost Dogs. This version was successful, especially in Australia, where it topped the ARIA Singles Chart for seven weeks. It also reached number two in the United States and Canada. The idea to cover "Last Kiss" came about after vocalist Eddie Vedder found an old record of the song at the Fremont Antique Mall in Seattle, Washington. He convinced the rest of the band to try out the song and it was performed a few times on the band's 1998 tour. The band eventually recorded the song at a soundcheck at the Merriweather Post Pavilion in Columbia, Maryland on September 18, 1998, and released it as a 1998 fan club Christmas single. The band spent only a couple of thousand dollars mixing the song. Bassist Jeff Ament said, "It was the most minimalist recording we've ever done." In the following year the cover of "Last Kiss" began to be played by radio stations and was ultimately put into heavy rotation across the US. By popular demand the cover was released to the public as a single on June 8, 1999, with the proceeds going to the aid of refugees of the Kosovo War. The cover also was featured on the 1999 charity compilation album, No Boundaries: A Benefit for the Kosovar Refugees. The song helped earn about $10 million for Kosovo relief. The cover would end up reaching number two on the US Billboard Hot 100, behind "If You Had My Love" by Jennifer Lopez. This remains Pearl Jam's highest-peaking song on the Billboard Hot 100. It peaked at number four on the Top 40 Mainstream chart. The song reached number five on the Billboard Mainstream Rock Tracks chart and number two on the Billboard Modern Rock Tracks chart. The "Last Kiss" single has been certified gold by the RIAA. Outside the United States, the song reached number two on the Canadian RPM Top Singles chart and became the band's highest-charting song in Canada. It later charted on the RPM Rock Report, where it reached number four and stayed there for two weeks. In Europe "Last Kiss" reached number six in Poland, number 42 in the United Kingdom and number 77 in the Netherlands. In Australasia, "Last Kiss" peaked atop the Australian ARIA Singles Chart for seven weeks and became a top 20 success in New Zealand. Christopher John Farley of Time said, "It's a spare, morose song with Vedder's voice warbling lovelorn over a straight-ahead drum beat. Going back to basics has put Pearl Jam back on top." Regarding the cover, guitarist Stone Gossard said, "You can try album after album to write a hit and spend months getting drum sounds and rewriting lyrics, or you can go to a used record store and pick out a single and fall in love with it." Pearl Jam included "Last Kiss" on the 2003 B-sides and rarities album, Lost Dogs, and on the 2004 greatest hits album, rearviewmirror (Greatest Hits 1991–2003). The rarities album's title Lost Dogs may refer to the subject of Winner's song "Der Deitcher's Dog", a dog that cannot be found, despite its description. Pearl Jam first performed its cover of "Last Kiss" live at the band's May 7, 1998, concert in Seattle, Washington, at ARO.space. Live performances by Pearl Jam of "Last Kiss" can be found on various official bootlegs and the Live at the Gorge 05/06 box set. The song has a long tradition in Latin American popular music. The most popular version was recorded in 1965 by Mexican singer Polo, (ex-member of Los Apson) with the title of "El Último Beso" in Spanish translated by the Mexican TV Director and tennis teacher Omero Gonzalez, this Spanish version has been covered by several bands: Los American's, Los Johnny Jets, Los 007, Los Doltons, also singers as Argentine Leo Dan, and the Colombian singers Alci Acosta (his recording became a hit in Colombia) and Harold Orozco [es] in 1967. Mexican singer-songwriter Gloria Trevi released her version of the song in 1990, peaking at number 36 in the Billboard Hot Latin Songs chart. In 2011, Trent Dabbs recorded a cover of "Last Kiss" for the hit television series The Vampire Diaries in Season 2, episode 18: "The Last Dance". Meadow Ryann covered this on her debut cover album, Wings. Cœur de Pirate covered the song for the soundtrack of the 2014 season of the Canadian TV show, Trauma. ^ a b c d "Joseph Edward Carpenter". The Thomaston Times. May 20, 2005. Archived from the original on July 17, 2011. ^ "Best Of '99: Author Of Pearl Jam's Biggest Hit Has God To Thank" Archived January 1, 2009, at the Wayback Machine. VH1.com. July 12, 1999. ^ "Forgotten Hits". Forgottenhits60s.blogspot.com. Retrieved July 22, 2015. ^ "Forgotten Hits". Forgottenhits.com. Retrieved July 22, 2015. ^ a b Inc, Nielsen Business Media (September 18, 1961). "Billboard". Nielsen Business Media, Inc. Retrieved November 22, 2017 – via Google Books. ^ "Last Kiss" by J. Frank Wilson And The Cavaliers". songfacts.com. ^ Matthew, Brian. "Sounds of the 60s". BBC Radio 2. September 26, 2009. ^ Erlewine, Stephen Thomas. "J. Frank Wilson | Biography". AllMusic. Retrieved August 18, 2015. ^ Doc Rock. "The Dead Rock Stars Club 1990 - 1991". Thedeadrockstarsclub.com. Retrieved August 18, 2015. ^ "Cash Box Top 100 11/07/64". Tropicalglen.com. Retrieved November 22, 2017. ^ "Cash Box Top 100 1/12/74". Tropicalglen.com. Retrieved November 22, 2017. ^ "Top 100 Hits of 1964/Top 100 Songs of 1964". Musicoutfitters.com. Retrieved September 27, 2016. ^ a b Canada, Library and Archives (February 8, 2017). "Image : RPM Weekly". ^ Canada, Library and Archives (July 17, 2013). "Image : RPM Weekly". Collectionscanada.gc.ca. Retrieved November 22, 2017. ^ a b Farley, Christopher John. "Last Kiss". Time. July 19, 1999. ^ Rosen, Craig. "Pearl Jam's 'Last Kiss' Becomes Band's First No. 1 Single"[dead link]. Yahoo! Music. July 1, 1999. ^ a b Stout, Gene. "Pearl Jam's Ament has smaller fish to fry at festival"[dead link]. Seattle Post-Intelligencer. July 30, 1999. ^ a b (2003) Album notes for Lost Dogs by Pearl Jam, [CD booklet]. New York: Sony Music. ^ a b "American single certifications – Pearl Jam – Last Kiss". Recording Industry Association of America. If necessary, click Advanced, then click Format, then select Single, then click SEARCH. ^ Anderman, Joan. "Wisdom of Pearl". The Boston Globe. May 24, 2006. ^ "Pearl Jam Songs: "Last Kiss"" Archived May 27, 2009, at the Wayback Machine. pearljam.com. ^ "Australian-charts.com – Pearl Jam – Last Kiss". ARIA Top 50 Singles. ^ "Ultratop.be – Pearl Jam – Last Kiss" (in Dutch). Ultratip. ^ "Top RPM Singles: Issue 8449." RPM. Library and Archives Canada. Retrieved October 19, 2018. ^ "Top RPM Adult Contemporary: Issue 8466." RPM. Library and Archives Canada. Retrieved October 19, 2018. ^ "Top RPM Rock/Alternative Tracks: Issue 8368." RPM. Library and Archives Canada. Retrieved October 19, 2018. 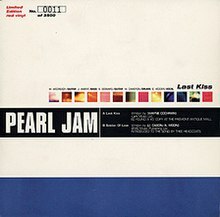 ^ "Dutchcharts.nl – Pearl Jam – Last Kiss" (in Dutch). Single Top 100. ^ "Charts.nz – Pearl Jam – Last Kiss". Top 40 Singles. ^ "Notowanie nr914" (in Polish). LP3. August 6, 1999. Retrieved February 16, 2019. ^ "Official Scottish Singles Sales Chart Top 100". Official Charts Company. Retrieved October 19, 2018. ^ "Official Singles Chart Top 100". Official Charts Company. Retrieved October 19, 2018. ^ "Official Rock & Metal Singles Chart Top 40". Official Charts Company. Retrieved October 19, 2018. ^ a b c "Pearl Jam Artist Chart History". Billboard. Retrieved April 28, 2007. ^ a b c "Pearl Jam – Billboard Singles". Allmusic. Retrieved June 11, 2007. ^ "ARIA Charts - End Of Year Charts - Top 100 Singles 1999". Archived from the original on March 12, 2012. Retrieved 2015-11-04. ^ "RPM 1999 Top 100 Hit Tracks". RPM. Library and Archives Canada. Retrieved October 19, 2018. ^ "RPM 1999 Top 100 Adult Contemporary". RPM. Library and Archives Canada. Retrieved October 19, 2018. ^ "RPM 1999 Top 50 Rock Tracks". RPM. Library and Archives Canada. Retrieved October 19, 2018.